Relax, dear friends, and take a deep breath–maybe not too deep, you might inhale something. But rejoice, because no, there will not be a Sriracha shortage after all. Yay. Now, I don’t currently make anything that rivals the marvel that is sriracha sauce, but it did get me thinking about how much I love hot sauce in general. It’s a lot. But the importance of a good sauce is not just the heat, it’s also about flavor. And many hot sauces really just one or the other. Of all the things you know how to make in your home kitchen, hot sauce might not have been on the list. It should be, though, because it’s one of the easiest things to do and then you can control both the heat and the flavor. In my case, I like to use poblano peppers, because I love the way they taste, and serranos. Sometimes I amp it up with habaneros or do a mix of serranos, jalapenos and other peppers. The fun part is playing around. Also, eating. Definitely eating. I’ve posted on this before, and you can find that post plus the original recipe here. This entry was posted in Recipes and tagged add-ins, sauce, spicy on November 4, 2013 by Lauren. I spent two days this weekend digging and playing around in a bed of chocolate. Chocolate mulch, actually. I was gardening. It still smelled delightful. It somewhat mitigated the hot, hard work of digging and planting. Of course, afterwards, my sore muscles really wanted a nice hot bath. So much so that as I was making dinner, I was a little jealous of the tomatoes in this sauce. I mean, look at those little red balls of tastiness bobbing in a warm, simmering olive oil bath. That’s the life right there, surrounded by fragrant, relaxing herbs. Isn’t that just the life? So this sauce is delicious and it only takes 20 minutes to pull together. It could work on pasta, pizza, poured over grilled meats and veggies or just dip your bread in it. I used it to make zucchini pizza. Take a few zucchini, cut them in half lengthwise and scoop out some of the flesh. Then pile on some toppings–I do cheese, a couple layers of pepperoni, the sauce and more cheese. Then put them on a cookie sheet and bake them for 350F for 30 minutes. Voilà. Crust-free, zucchini pizza with delicious homemade sauce. Put everything into a saucepan. Bring the olive oil to a simmer and let it cook at that level for 20 minutes. Pour the mixture into a blender, pulling out any herb stems. For a chunky sauce, pulse a few times until the large pieces are broken up. 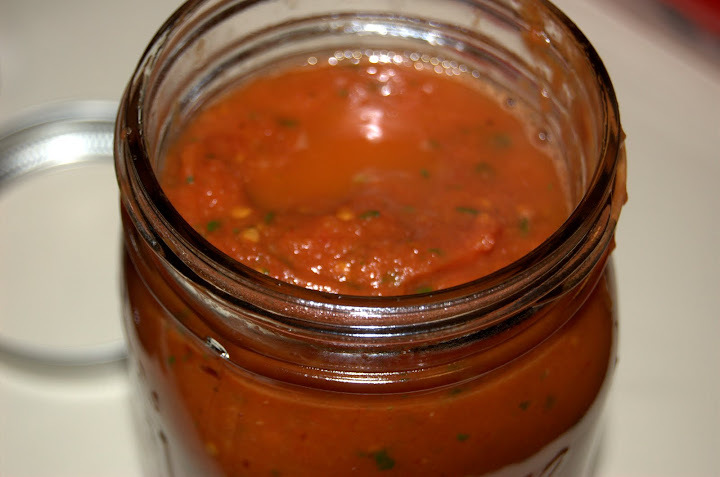 For a smoother sauce, puree completely. This entry was posted in Recipes and tagged herbs, pizza, sauce, tomatoes on August 6, 2013 by Lauren. Got to visit Boston for the first time this past week. I was there for a conference and didn’t get to see a lot of the city, but I did walk a fair bit around the Back Bay area where the conference was. It was beautiful and I can’t wait to go back. I also got to have my first modernist, molecular gastronoy-esque meal at L’Espalier. The dinner was incredible–you can check out my pics here. And it was definitely an experience. However, after a whole week of eating out, I was really ready to come home and cook something. I also wanted something really simple. It’s just me this weekend–Josh is in Vegas for his own conference (I know, right? )–so I figured I’d make myself something low-key. Normally, making ravioli is a little bit of a production, but for general ease, I like to use wonton wrappers. They don’t produce exactly the same texture, but they’re good and fun nonetheless–plus, one less series of steps to take. Here, I just wanted to showcase the basil fresh out of my garden with a little bit of creamy cheese and some olive oil. I also wanted to use up the rest of the frozen peas sitting in my freezer, so I made another batch of delicious green pea-mint sauce. That plus some diced, crispy ham made for a light, lovely repast. Prepare a pot of gently simmering water. Lay out a wonton wrapper. Brush it with some of the olive oil. Place about a teaspoon of mascarpone cheese in the center and top it with a small basil leaf. Sprinkle on a little bit of salt and pepper and grated parmesan. Dip your brush into the water and brush around the edges of the wrapper. Then fold the bottom corner up to the opposite corner, creating a triangle, carefully smoothing the edges of the wrapper together into a tight seal. Repeat for each additional wonton wrapper. Gently lower the ravioli into the pot of simmering (not boiling!) water and cook for about 2-3 minutes. Remove and let dry on a paper towel. Heat up the canola oil and butter in a medium-sized frying pan. Add in the diced ham and fry until crispy, then add in the ravioli and (gently again) fry until crisp and browned on each side. Serve the ham and wonton ravioli with a healthy drizzle of green pea-mint sauce, or even just a bit of olive oil or browned butter. This entry was posted in Recipes and tagged basil, mint, pasta, peas, ravioli, sauce, vegetables, wonton on August 3, 2013 by Lauren. We have a new fence! It’s very exciting. It looks beautiful and it’s intact. It’s also four feet tall at the shortest level, so Maggie (our Mastiff) has to stand up on her hind legs in order to peer over it, which she can’t do for very long. She ends up looking like a prairie dog, searching the horizon for predators, before popping her head back into the confines of the yard. It’s hilarious. it also has nothing to do with green pea mint sauce. Well, at best, they are only tangentially related. But this sauce is as delicious and easy as Maggie is hilarious. It’s a particularly great recipe if you’re just cooking for yourself or for the two of you. It’s quick, has few ingredients and requires little effort, but it can jazz up some leftover chicken breasts or a rotisserie bird with a great, fresh burst of flavor. It was actually my dinner tonight, along with a side of rosemary potatoes (see below) and this week’s Champagne Wednesday watermelon cocktail. And it was delicious. Cooking for one often ends up being quick and simple but that doesn’t mean you can’t treat yo’self. And sure, the heavy cream in this recipe might negate some of the healthier aspects of the peas but the verdent green color will at least make you feel really good :). Heat a small saucepan on the stove over medium heat. Add the butter and the peas and cook, stirring occasionally, until the peas are thawed and heated through. Add half the peas to the blender, along with the mint and and heavy cream. Purée until smooth. If you need a slightly thinner consistency, add some chicken or veggie stock, one teaspoon at a time until the desired results are achieved. Add the pea puree back into the sauce pan, along with the herbed goat cheese. Cook until the goat cheese has melted into the peas, stirring occasionally. Taste and add salt and pepper as needed. Serve over...well, anything, but I found grilled chicken to be particularly good. Here’s a “no recipe” recipe for rosemary potatoes: quarter some new potatoes. Put them in a saucepan and cover them with at least a spare inch of water. Boil until fork-tender. Drain the water and add in a tablespoon of butter and a teaspoon of olive oil, as well as some chopped rosemary and a sprinkling of sea salt and cracked pepper. Cook over medium high heat until browned and crispy, stirring occasionally. This entry was posted in Recipes and tagged chicken, mint, peas, sauce, vegetables on July 24, 2013 by Lauren. This was a sad week. Our household was struck down by the plague. Well, a cold. But a vicious cold. You know, like one of those snarling, drippy cartoon germs you see in commercials. It ruined all my weekend plans of…doing nothing. I mean, sure I still did nothing but I didn’t enjoy it as much. I missed the beautiful 80-degree day that was Sunday. I missed two days of work after that. So did Josh–which is how you know this was a bad cold, because Josh rarely gets sick and even more rarely takes days off because he’s sick. And sadly, I missed all my good opportunities in the kitchen–there were no baguettes baked, no pretzels dipped in chocolate, nothing. Oh the humanity! 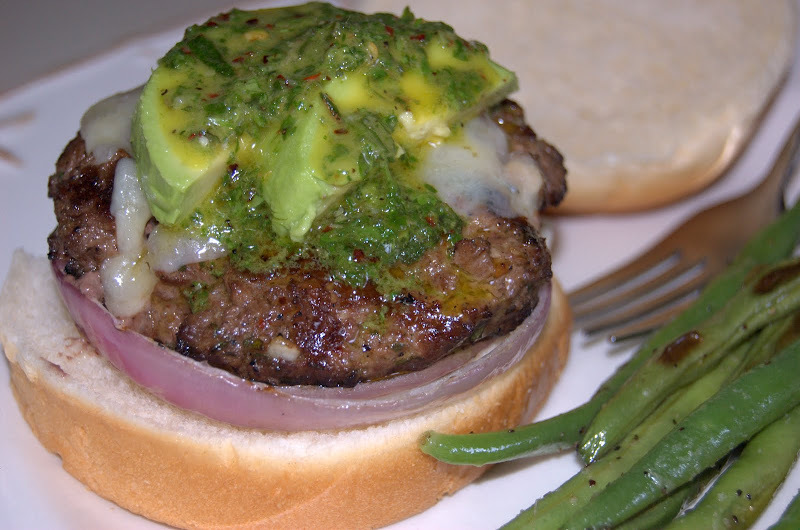 This entry was posted in Recipes and tagged burgers, herbs, sauce on April 14, 2011 by Lauren. It’s official, folks. Halloween has come and gone. There’s frost on the ground overnight. Today was a high of 51F. Starbucks has switched to its Christmas cups. Yep. It’s begun. The Wintering. And with the Wintering comes the Colding, the Freezing and the inevitable Wanting to Hibernate. But never fear, Random Internet Person. All is not lost. I mean sure, it’s mostly lost for about the next oh, seven months or so (I do live in Michigan), but there are a few hardy, rugged things that will help you get through the winter. 1. A bearskin rug. Just looking at it will make you feel warmer. Even better if the bear is still attached. I mean, hey, nothing warms you up like cardio, right? Run faster! 2. 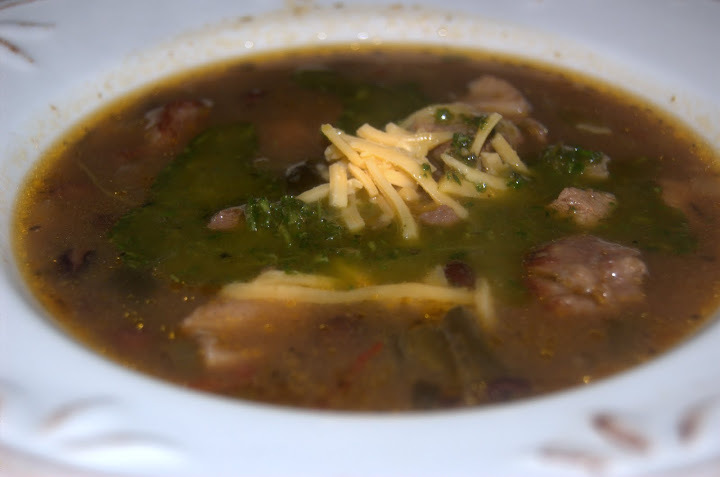 Comfort foods–lasagna, chili, stew, pulled pork, short ribs, cookies fresh from the oven—warm foods to heat your insides…and after all, after all that exercise running away from the bear, clearly what you need most is high-carb, high-fat, heavy foods to gently gel your insides into organ butter. 3. A heater. Really people, pay your heating bills. This entry was posted in Recipes and tagged add-in, sauce, spicy on November 4, 2010 by Lauren. This was a most excellent weekend. A busy, exhausting one, but most excellent indeed. Let’s recap, shall we? This entry was posted in General Musings, Recipes and tagged add-ins, hispanic, Mexican, salsa, sauce on October 4, 2010 by Lauren. I had some time to waste the other day after work and since it was a beautiful day, I decided to walk down to the Kerrytown Market and pick up something for dinner. I was thinking, some chicken to grill would be great. We’d been eating a lot of pork and beef and I was getting kind of bored and it was just the perfect kind of day to break out the new grill again. I knew we had some lovely, giant summer squash given to us by a couple of friends so all I really needed to complete the meal was an entree and some fresh sliced bread that I could dip in herbs and olive oil. Yum. 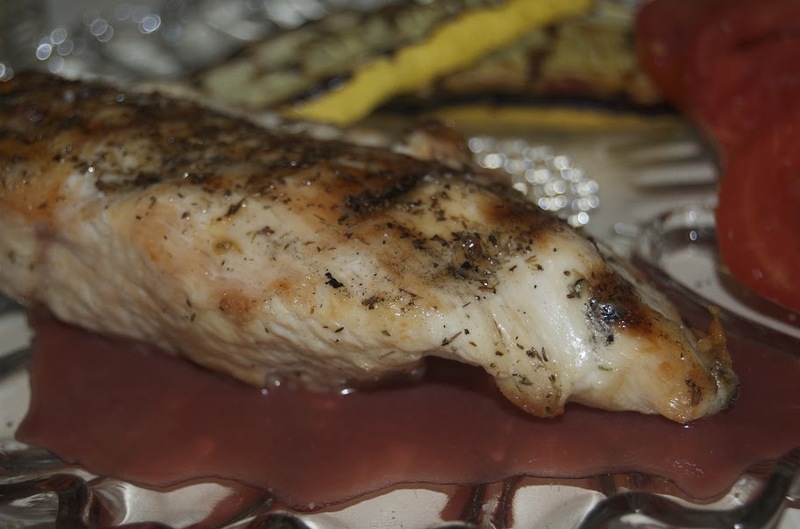 The boneless, skinless chicken breasts in the case at Sparrow’s looked fantastic and I knew just what to do with it. I still had a few bottles of pomegranate juice from the last case the lovely people at Pom Wonderful sent me (and here you thought I used it all up in those pom-chocolate-mint mojitos), and I had plenty of cream thanks to our weekly Calder’s dairy delivery. (Yes, that’s right–dairy delivery. I have a milk man. I’ll dish more on that in another post later.) And for some reason, I really wanted to put the two together. This entry was posted in General Musings and tagged chicken, Grill, sauce on July 31, 2010 by Lauren. First, a layer of French vanilla ice cream. Then some pomegranate glaze (leftover from cheesecake!). Then a heaping spoonful of chocolate sauce (I use melted chocolate plus a bit of milk). 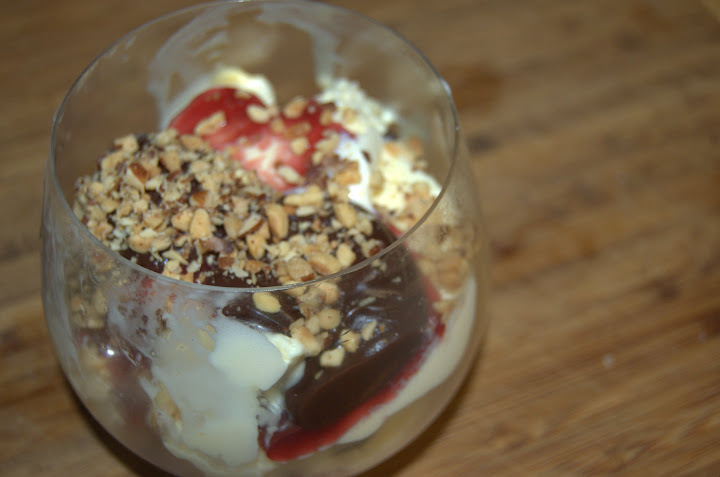 Then pomegranate and chocolate together. 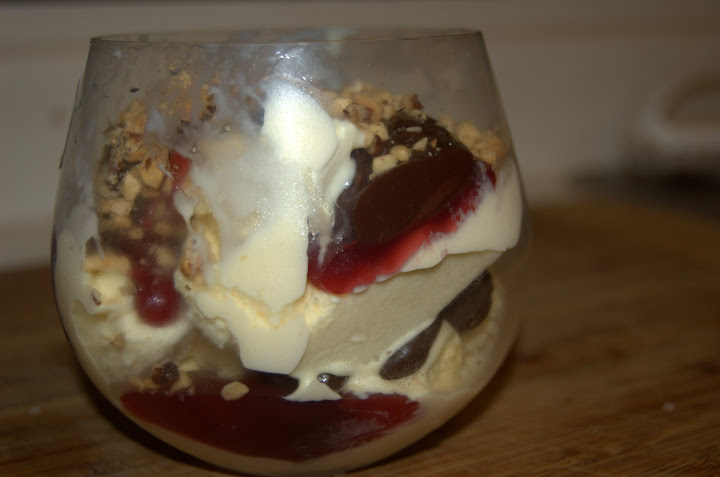 This entry was posted in General Musings and tagged chocolate, dessert, fruit, ice cream, sauce on September 24, 2009 by Lauren. 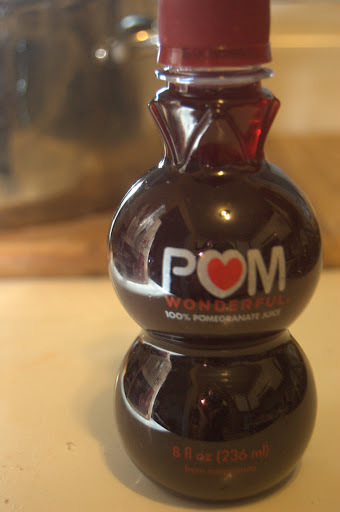 I got a delicious shipment in the mail this past week: a case of Pom Wonderful pomegranate juice, from the Pom people themselves. My challenge? Use the eight little bottles of liquid pomegranate to come up with something interesting and delicious. I found this fascinating, as did my friends, many of whom love pomegranate. Myself, I’d never really experimented with it. I once purchased a pomegranate to try out, messily cutting it open and excavating the seeds (arils), which I found delicious but then never bought another one. Still, the fruit somewhat intrigued me, as do most fruits from south Asia. Plus, they just look so funky. I’m a sucker for those swanky design spreads where hip decorators have created oh-so-chic-but-simple accents with giant hurricane vases full of fresh pomegranates. Sure I could never do that because my dog would probably think, “Wow! Balls!” but that’s not the point. Barbecue. Barbecue is always the point. At least, it was one of the first things that came to mind when I thought, “Gee, what can I do with 64 ounces of pomegranate juice? Barbecue!” That particular eureka was followed up with “Cheesecake!” which was a suggestion from a friend during dinner out the other night. Then another idea: add it to your granola bar recipe. Mix it with Greek yogurt and marinate chicken. And oh…imagine the drinks. 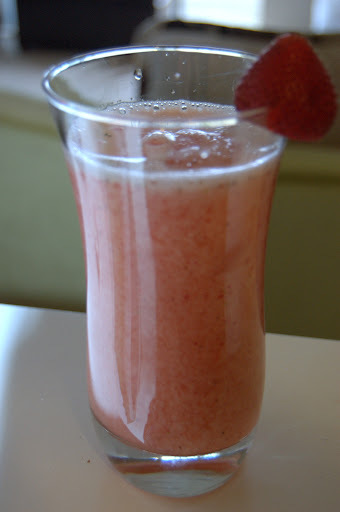 This entry was posted in General Musings and tagged drink, fruit, sauce on September 20, 2009 by Lauren. Piri piri. Just say it, “piri piri.” It sounds adorable. It tastes delicious. It’s easy to make. It’s a win for everybody. Well everybody who likes to eat foods with fun names. I was on my own for dinner again tonight and after a lot of deliberation (seriously, I dwell at length on the existential question of “What to eat for dinner?” just about everyday), I decided to try making my own piri piri sauce and using it with some grilled chicken. I figured I could have a nice couple of sides by cooking some broccolini we just got from the farm share this week and by cooking up some quick whole wheat couscous AND I could make enough to have a hearty lunch for tomorrow. Epic win. 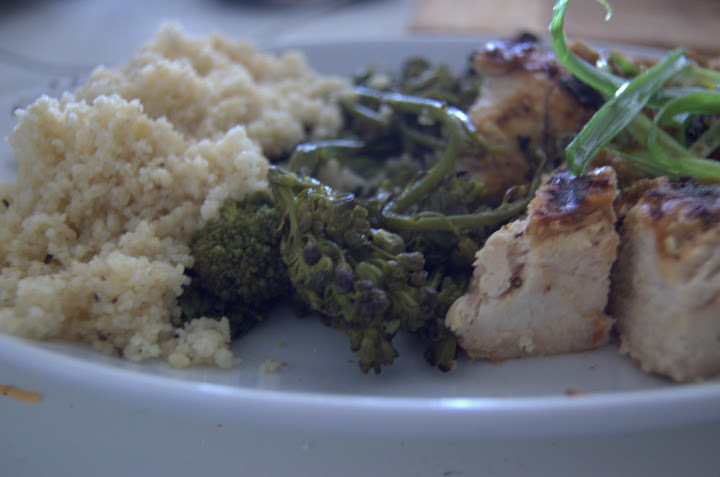 This entry was posted in General Musings and tagged African, chicken, healthy, sauce, spicy on August 5, 2009 by Lauren. My Big Fat Greek..nah, that’s too obvious a joke. 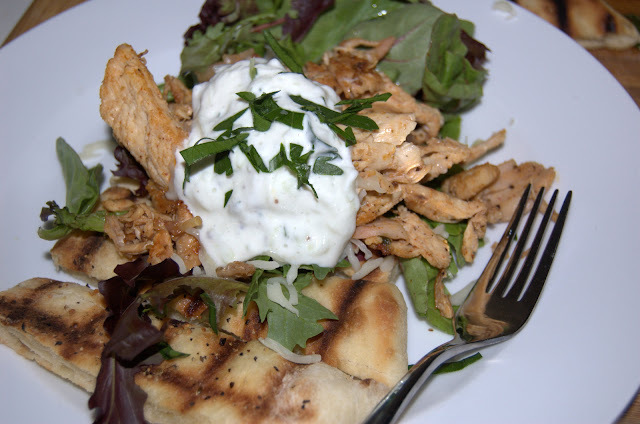 The chicken was actually moroccan inspired, as was the flatbread…so…really the only Greek thing about this dinner was the tzatziki sauce. This entry was posted in General Musings and tagged bread, chicken, Greek, Grill, healthy, Moroccan, sauce on July 22, 2009 by Lauren. They are my final frontier. There is so much to explore with them and yet, I’ve only been so far as the moon. Which is made of mozzarella. Not green cheese. Well maybe it gets moldy from time to time. Anyway, it was an off-again-on-again rainy kind of day and it’s been kind of a tiring week, one of those weeks where I’ve been craving comfort foods all the time. So far this week there’ve been hot dogs, barbecue, pizza, Hunan chicken and today, pasta. Rigatoni. With red sauce. And chicken meatballs. 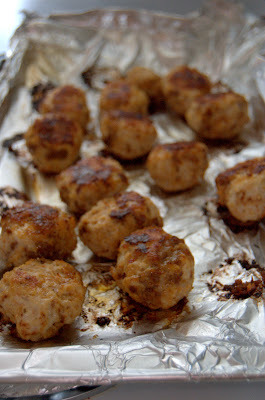 This entry was posted in General Musings and tagged chicken, comfort, meatballs, pasta, sauce on July 15, 2009 by Lauren.